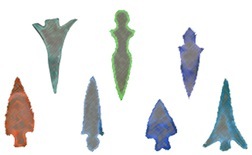 Example of the Pacific Arrowheads. Inquire regarding currently available pieces in this style. The historical arrowheads that provided the inspiration for my interpretation is shown above.